A few photos of the boys, including several of Hope’s little monster darling Teddy, who likes to chew on his foster brother’s rear leg for fun. Here’s a film of the puppies having some playtime, with us and with their mom. As you can see, a week makes a HUGE difference in the puppies’ development! A few photos that I didn’t get around to adding the other day. Look at how cute everyone is – and eyes are all open! Last night, Teddy (that’s the Fawn boy’s new name) actually played with me. OK, Sean thinks I was imagining it, but I swear – he was playing! Tula’s boys turned a week old yesterday, and we celebrated by shooting another video, which I’ll have uploaded for you tomorrow. Everyone is doing just peachy – Striker, our little pied foster baby (who is actually four days older, but now has the same honorary birthday as the boys, just to make my life simpler) is finally looking fat and sassy. He’s almost caught up with Tula’s two hulking big bruisers, and that’s saying something. Here’s a question for you – do you find puppies at this age as unspeakably adorable as I do, or do you believe (as some nameless people do – ::cough::Fran::cough::) that they look more like little gerbils? My veterinarian, who is a wonderful woman and a great doctor, took a final look at the fawn boy before we left the clinic the other day, and blurted out “They sort of look like rats at this age, don’t they?”. While I clutched my chest in mock horror, her groomer shrieked from the back room “Are you nuts? Don’t tell a breeder her puppy looks like a RAT!”. She apologized, and I pretended to forgive her (untrue, I’ll hold that grudge forever! ), but I was simply stunned to learn that not everyone is as enamoured of puppies at this age as I am. So, what’s your secret opinion? Lemme know on the poll, and below the cut you’ll find (quelle shock) yet more puppy photos. 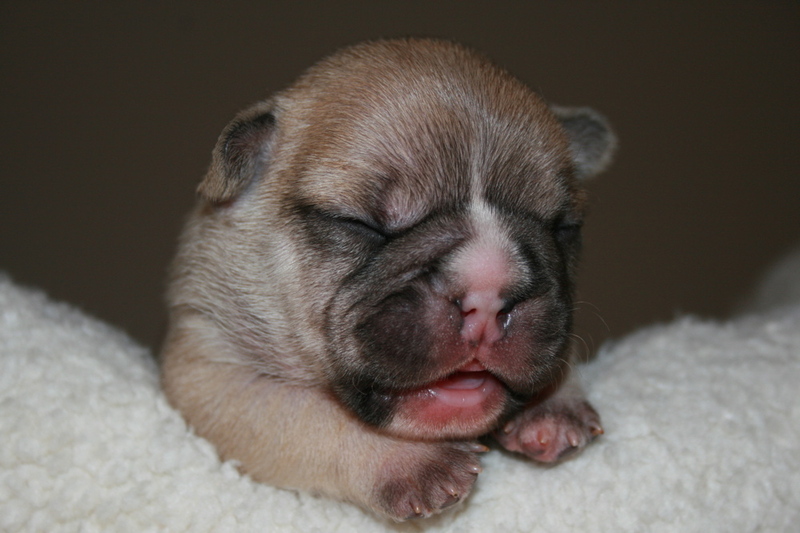 https://i0.wp.com/www.bullmarketfrogs.com/wp-content/uploads/2015/04/Brindle_pied_frenchbulldog.jpg?fit=662%2C662&ssl=1 662 662 Carol http://www.bullmarketfrogs.com/wp-content/uploads/2015/06/bullmarket-logo.png Carol2010-03-06 22:18:092010-03-06 22:18:09Happy Birthday Dear Puppies! What can I say, I have an addiction.